This is a great idea. What's really amazing is that you got it to work so well with so little hardware. I will be watching your progress on this closely. This is incredible! 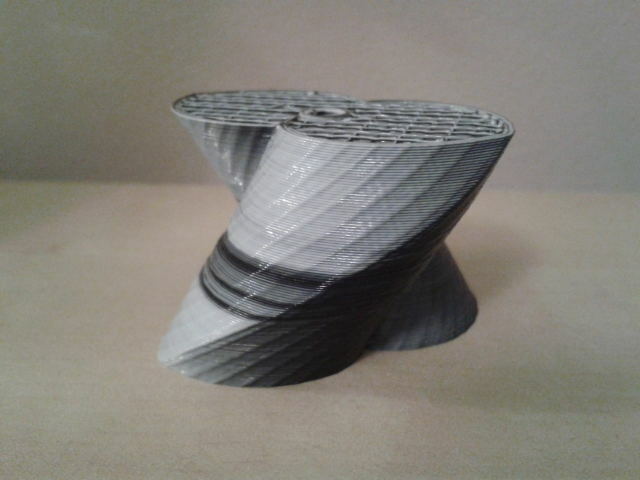 Being able to print gradients opens up so many possibilities. Something else just occurred to me. if you can get a good mix of the colours does this mean that we can print any colour with just three or four primary colours of filament?? Yes - any colour from four (or maybe five - I suspect you'd need both black and white + three primaries) should be possible. We'll need cyan, magenta and yellow, I think. Exciting times for colourful 3d prints! Very nice work, full colour here we come! 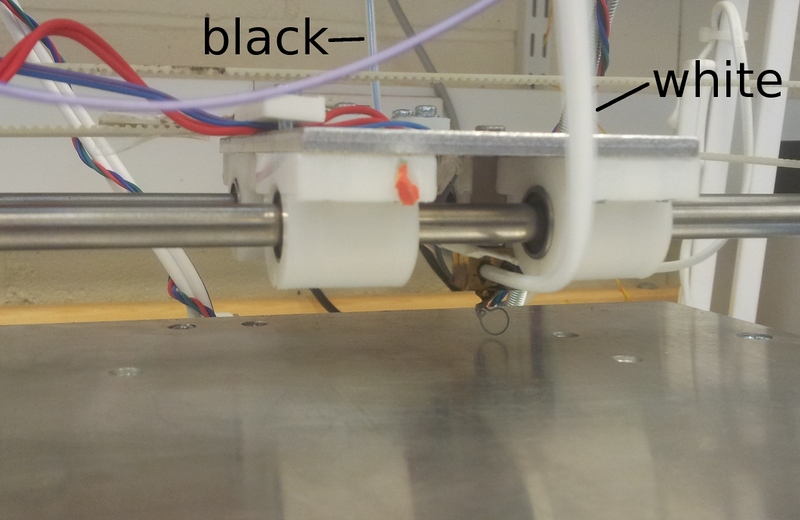 I wonder if a mixing chamber with a dye injector and natural filament wouldn't also be a good approach. Possibly, though I am told that mixing concentrated dye into a conventional extrusion process is very difficult - you have to have it already in a plastic carrier anyway. Amazing!! i think is another big step !! Could you cause mixing by essentially dithering the colors together? Instead of pushing the white and black together, push the black a quarter step, then the white a quarter step, then repeat. It might be enough to give an undulating dithered pattern to the mix instead of stripes. Either way, I'm looking forward to playing with this. Too bad my parts kit is still weeks away. Science! :) I've wondered for the longest time how mixed colored plastics would turn out - would they actually blend, or just create a rainbow mess? I wondered if you needed to mix dye before injecting, or if that would screw up extrusion. I still wonder if different mixtures have a chance of changing the properties of the resulting plastic such that the melting temperature is affected? :o Glad to see progress marching forward! Dithering is a neat idea, but I think the reversibility of the flow would make it less effective than one might imagine. One could always scribble with the nozzle a bit to mix on the outside. I guess you would need something like a spiral like those used in the nozzles for mixing two component glue. In those nozzles you can see the glue spiraling through the nozzle and eventually being mixed. I think the joint area will need to be bigger than it is for a glue nozzle, but I guess it will also become a very complex design, and of course, how would you get that spiral machined into a brass nozzle? Create a nozzle through laser sintering maybe, not sure if that would give a good enough quality and whether it could withstand the temperatures required for a longer time. Hmm, interesting challenge. 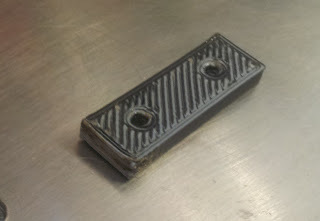 An idea from Rhys is to use metal (i.e. stainless steel) Luer tips as nozzles in general. This would make swapping easy (to change diameters, for example), and you can get glue-mixer Luer tips. You can also get M5 to Luer adaptors. Yeah, looks like 5 colors would get you full color. CMYK, plus white to maintain the volume. I'm guessing you could use standard RGB to CMYK equations to get 4 of the filament rates and set W to the top speed minus the sum of the other 4. 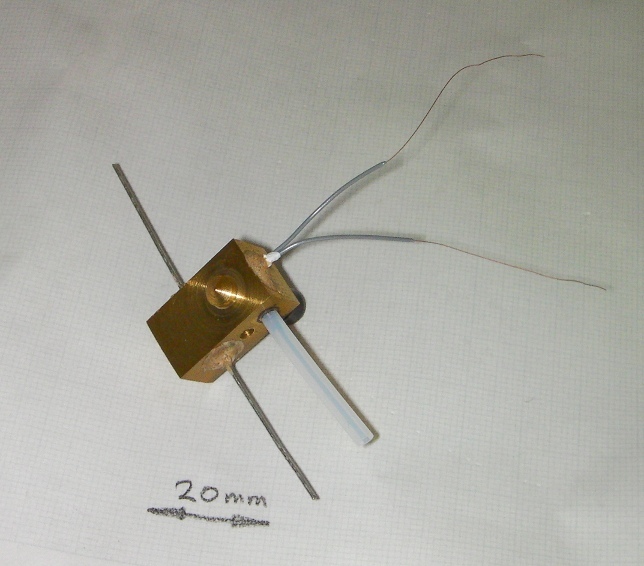 Great work, maybe mixing based on vibrating piezo element could help. 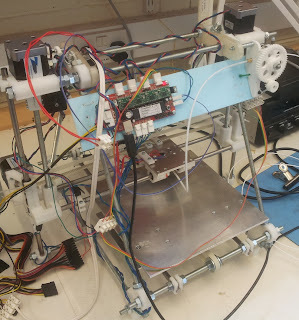 I have written code for sprinter that adds two new outputs; extruder steps at 1/2 speed and extruder steps at 1/3 speed. This was intended to drive a triple extruder (see thingiverse 16782) I'm now working on a triple extruder where the active filament(s) are selected by solenoids. The extruder speed needs to be slowed down to 1/2 or 1/3 for color mixing.... I've got the model built, but my latest batch of filament is giving me fits! How are the Bowden tubes attached to the heater block? This is cool. I had thought about some sort of "dopant" injection system with maybe a hypodermic needle going into the center of the plastic stream. Also, might be able to add a needle valve type arrangement to control how much of each color is added. 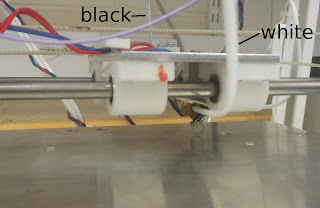 This has probably been suggested already but I was wondering how difficult it would be to add the inkjet extruder from an ordinary inkjet printer and the electronics to drive it to the final stage eg hot end of a reprap printer and just use white filament? It would be cool to mix materials. For example material X and Y could lead to Z. That way it is possible to print a lot of materials with a limited set of base materials (for example alloys).